These Traditional Camouflage style Luggage Tags will blend right in with the travel terrain. Well, maybe not, but they will look really cool on your bag! We offer them in a variety of colors so that you will be able to find your bags easily. 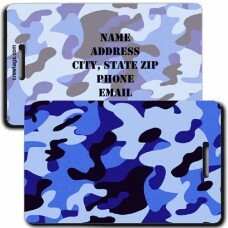 Take these Blue Camouflage Luggage Tags with you on your next trip. 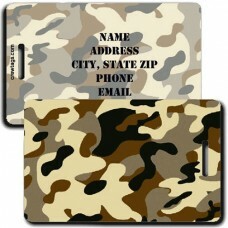 We can print just about anyth..
Take these Desert Camouflage Luggage Tags with you on your next trip. We can print just about any..
Take these Gray Camouflage Luggage Tags with you on your next trip. 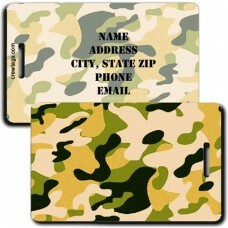 We can print just about anyth..
Take these Green Camouflage Luggage Tags with you on your next trip. We can print just about anyt..
Take these Orange Camouflage Luggage Tags with you on your next trip. We can print just about any..
Take these Pink Camouflage Luggage Tags with you on your next trip. We can print just about anyth..
Take these Purple Camouflage Luggage Tags with you on your next trip. We can print just about any..
Take these Yellow Camouflage Luggage Tags with you on your next trip. We can print just about any..